The Mt. Zion Memorial Fund wants to thank Chris Johnson for holding a benefit in support of our efforts to honor blues musicians by keeping their graves clean in Mississippi. Here is a laudatory piece from the Minnesota Tribune from Summer 2014. The restaurant has since exploded in popularity, but no longer serves as a live music venue/juke joint. Not since Nov 2015. Not your daddy's blues at St. Croix River area barbecue joint. Not far from the Andersen Windows plant in Bayport is a barbecue place that billed itself (until November 2015) as a juke joint, and while not quite raucous, it's most definitely loose. One night last week, there was no cover for the music, and no charge for a buffet of Texas-style barbecued chicken, pork and ribs. Everything but the beer, the wine and the moon-shine could be had for tips only — if customers were so inclined, of course. Jars were positioned onstage and on the band's merchandise table. And, yes, you read it right — moonshine, or white corn whiskey. There is no gin-and-tonic, and no light beer, either, at Bayport BBQ, 328 5th Av. N.
Free barbecue is not standard at the club; there were special circumstances involved on Tuesday night. Still, one gets the sense that Bayport BBQ owner Chris Johnson likes to improvise. Whether a band plays inside or outside — or, in the case of the group Gravel-Road, of Seattle, an hour earlier than scheduled — you can't be too sure. Not to be questioned, however, is Johnson's love for the music of the passionate outsiders who fall under the wide umbrella of "deep blues." 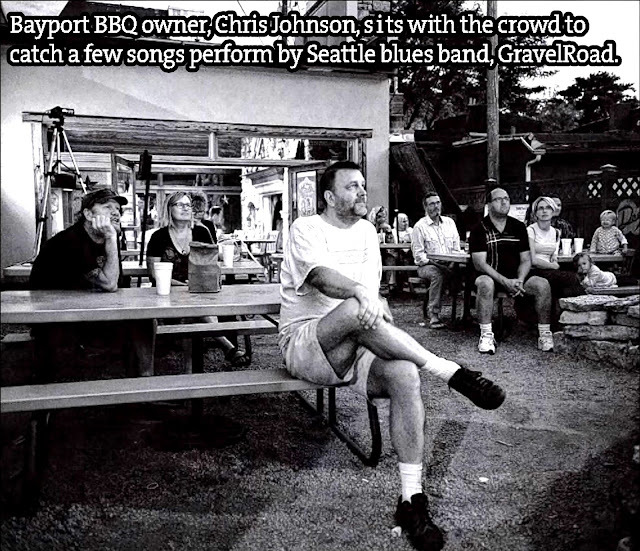 Johnson gambled and lost — financially — when he staged a few deep blues festivals before he opened his barbecue joint on Halloween 2010 to support and showcase the acts and their hard-edge sounds. Seven days a week, Bayport BBQ offers a lunch buffet, and on a recent Friday afternoon, the clientele included a father and his son and a few groups in crisp casual work attire. Playing on a TV in the corner of the room was a live music performance featuring local roots-rocker Molly Maher. Under the screen was taped a message that read: "We are a music venue and will not turn down the music. You are certainly welcome to take your food to go." 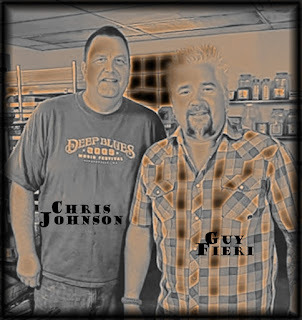 Asked if his goal is to gain attention for the quality of the barbecued meats or to sim-ply offer them up to make the music possible, Johnson said that he sometimes will hear people say, "Pick who you are," restaurant or music venue. To that, he replies: "We are what we are. If you like Texas barbecue and have an interest in food, we have that for you. And if it's the music, we've had bands call us from around the world to play here. We are a destination." Another way to look at it, he said, would be: "We aren't for everyone?' That's the slogan on the back of the club's T-shirts. 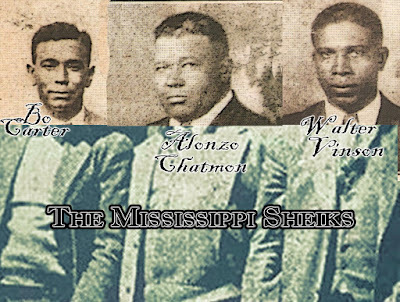 Many musicians and observers trace the genesis of today's deep blues movement to the 1992 documentary, Deep Blues. Two artists in particular, R.L. Burnside and Junior Kimbrough, of the North Mississippi hill country, benefited greatly from the exposure, seeing albums released on Fat Possum Records. 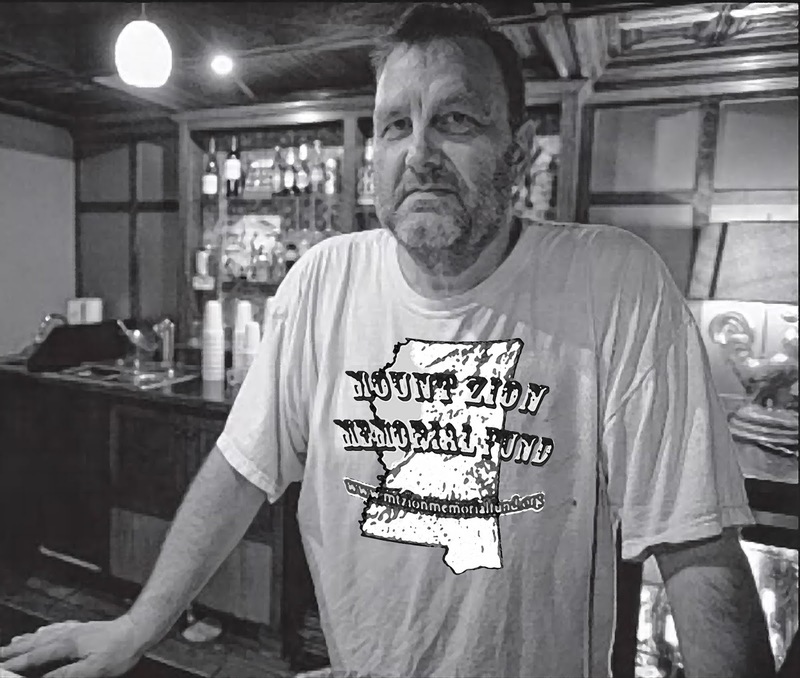 John Paul Keith, a Memphis guitarist who is booked to play Bayport BBQ with Maher next Sunday, said last week that "the blues has seen better days, but there are still some great guys out there doing it," including Leo "Bud" Welch, a label-mate of Keith's who plays gospel blues in the hill country style. Welch performed at Bayport BBQ in January. In the Deep Blues documentary, Robert Palmer, the late New York Times music critic, stands outside a juke joint in Clarksdale, Miss., explaining the origin of the word "juke." It came to America from West Africa, he said, and meant "to have a good time." 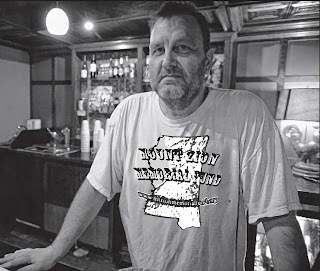 Bayport BBQ, as a self-titled "deep blues juke joint," is rooted in the music of another Fat Possum artist, the late T-Model Ford. About 13 years ago, Johnson, who then owned an agency that sold surety bonds for public works projects, went to see a performance by the blues guitarist Johnny Winter, and was transfixed by the single song he managed to catch by the opener, T-Model Ford. So began an immersion into the Fat Possum roster and deep blues movement, and then the festivals, the club and his friendship with many artists, including Ford, with whom he once shared a hotel room. Johnson recalled how the musician, then in his late 80s and the product of a rough life that included serving time on a chain gang for murder, broke the nighttime silence with a prayer that was "loud, vocal, a real conversation with God," he said. "It caught me off guard — what faith he had," Johnson said. GravelRoad, as it so happens, backed Ford in concert at Bayport BBQ in 2011, and from the stage last week, Marty Reinsel, the band's drummer, shared memories of Ford — fortified by coffee and a Little Debbie snack cake — riding in the city's Memorial Day parade in the back of a pickup truck with the club's banner on the side. As for Bayport BBQ, John-son said that he and his wife Kristen aim to keep it going until their three children, all of whom work there, are out of school. The good news for outsider-blues fans is that their youngest is 12 years old.